To view the Gloucestershire Airport Scale of Charges please click here. Charges are applicable to all aircraft. We reserve the right to adjust the charges of any service or facility without prior notification. Charges are levied on each arrival and are payable prior to departure, based on published or CAA Registered MTWA. Additional charges apply for instrument approaches. For home based aircraft, subsequent Touch and Go’s are charged at 40% of the rates shown. Operators of group, privately-owned or business aircraft less than 3MT based at the Airport may elect to purchase blocks of full stop landings in advance. Blocks have a maximum validity of 12-months from date of purchase. Touch and Go landings will be charged separately at 40% of the ‘pay as you go’ rate applicable to the aircraft. Refunds will only be made in very exceptional circumstances. Home based operators are strongly encouraged to adopt ‘green’ technologies. A landing fee discount of 25% will be available to all aircraft >800kg MTWA, fitted with diesel engines or retrofitted with silencers or noise-reducing propellers. Evidence of certification will be required. All Instrument Training is subject to prior permission from ATC. We reserve the right to charge the fees shown above if an aircraft fails to arrive for, or cancels a pre-booked instrument training slot with less than 60 minutes’ notice. 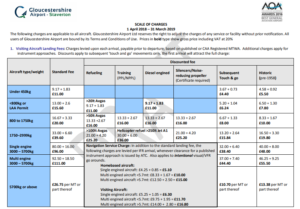 Unless operators have account facilities with Gloucestershire Airport Ltd, all fees must be settled at the time of landing, otherwise they will be subject to an administration charge. Overdue accounts may be subject to debt recovery costs and interest charges as per late payment legislation. Helicopter hangarage charges depend on the dimensions of the aircraft and number of rotor blades. Details are available upon request. Resident hangarage charges apply per calendar month. Part months at commencement and termination of tenure charged on pro-rata basis. The minimum tenure is one month, with one months’ notice required to terminate the agreement.